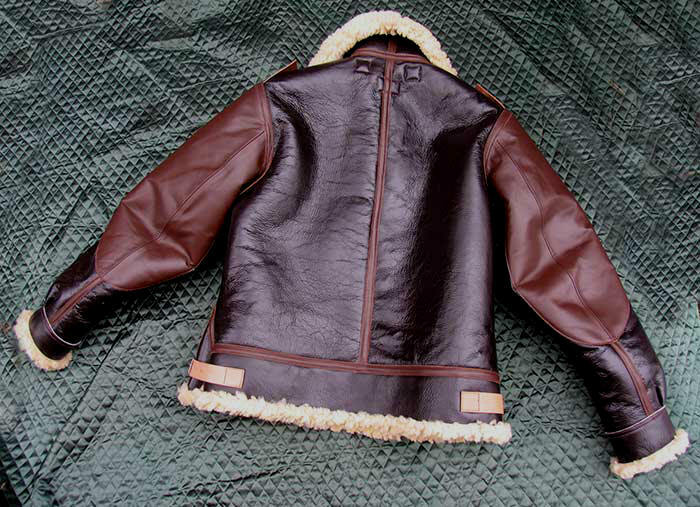 The perfect AAF B-3 WINTER FLIGHT JACKET. Knowledgeable customers are dumbstruck. 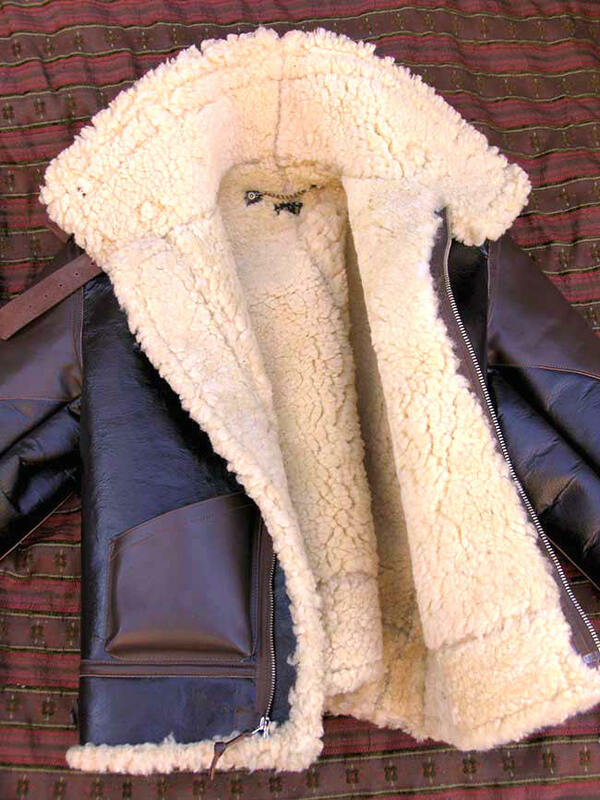 Thick Off-White American Sheepskin in the precise World War II Seal Brown dye. 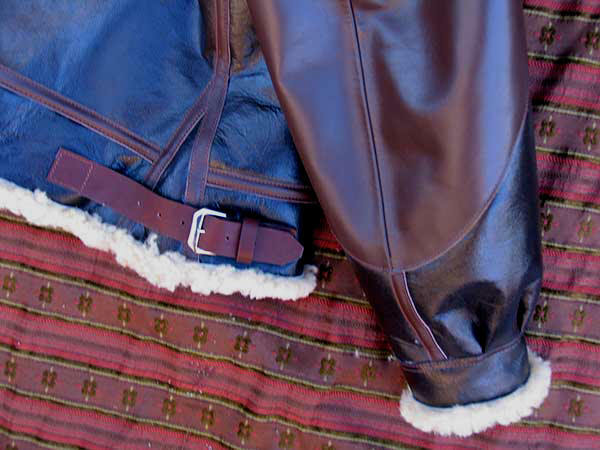 With our famed Chrome-Tanned Russet Horsehide facings, pocket and trim, including insignia rank tabs. Die-cast fully accurate Nickel Buckles and Harness Leather Belting. 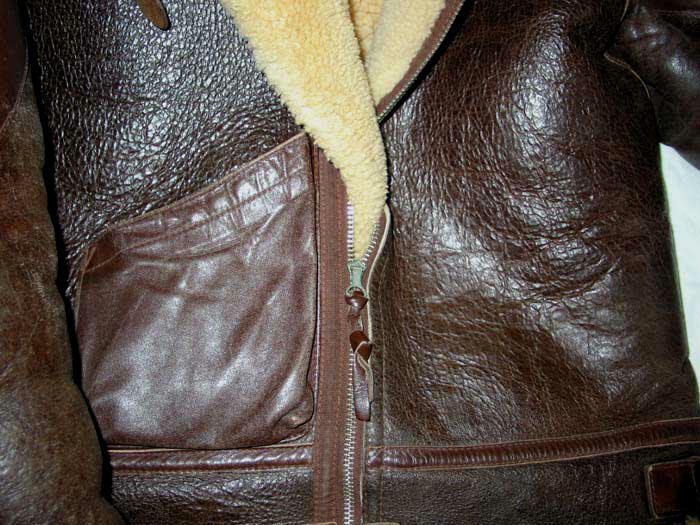 Note the single open patch Pocket, intended for gloves and maps. So-called replicas with slash pockets are inaccurate: no original B-3 came with such. Original B-3s are extremely hard to find in good shape. 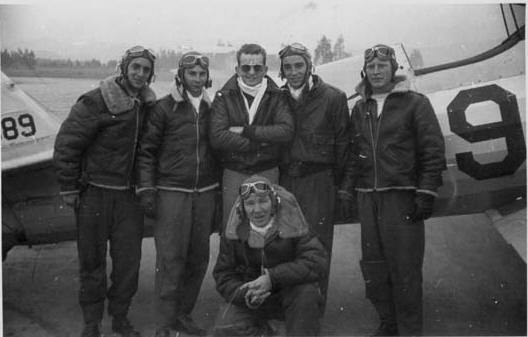 Wartime examples were often shared, and in cold, cramped aircraft took a real beating. In fact an AAF document exists for depot-refinishing fatigued examples by spray-dyeing them with polyacrylate lacquer. Collectors have probably come across these -- the ones that feel like dried mud! This was not, of course, the original finish but rather a combat theater depot quick fix. Despite what you may have elsewhere read. 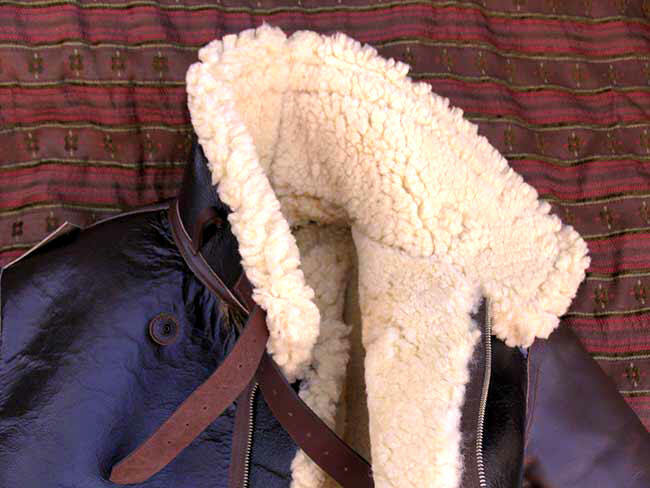 If your reproduction B-3 flakes or wears prematurely, spots, fades -- it's incorrectly tanned. Period. Correct AAF were drum-dyed, then finished with polyacrylate-type top lacquers/varnishes. If a current B-3 abrades its top grain immediately it's wrong, of course, unless the AAF were idiots. They were not idiots. They were the best this country has ever produced. 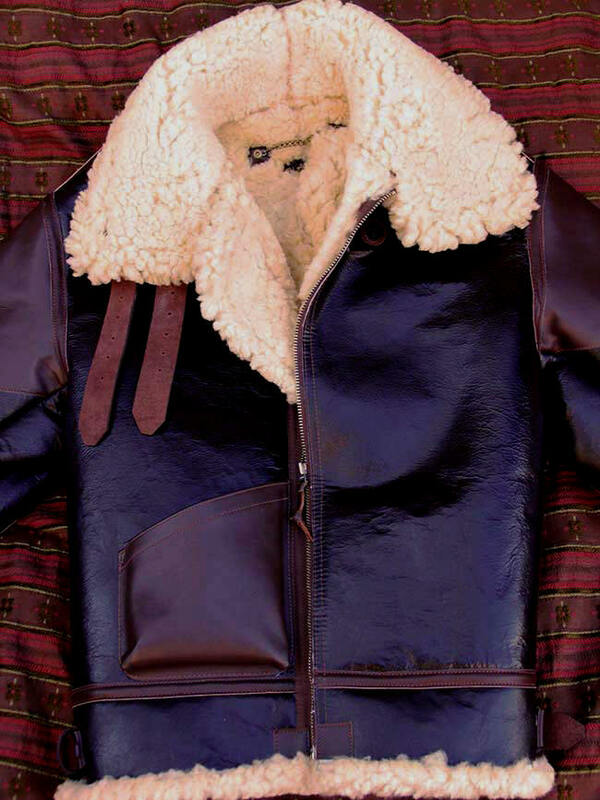 When one thinks of the AAF Winter Sheepskin Flight Jacket it's the B-3, immortalized in countless classic movies -- William Holden in STALAG 17, Steve McQueen in THE WAR LOVER (see above shot). The legend and appeal never diminish with age or the vapid changing winds of "fashion." 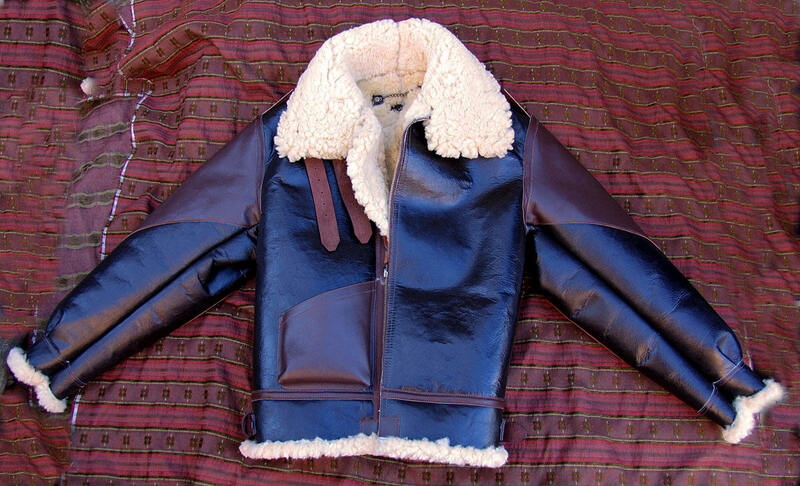 An extraordinarily warm jacket -- designed for use at 25,000 feet -- one never needs a sweater even in the coldest weather. 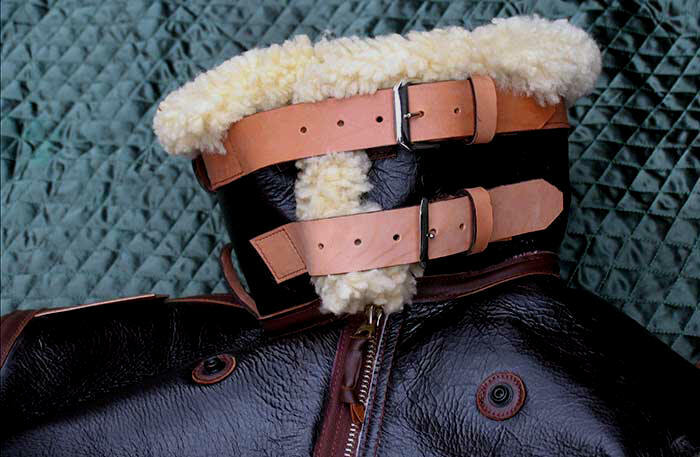 You'll wear it open much of the time, exposing an ocean of thick, luxurious American Shearling. 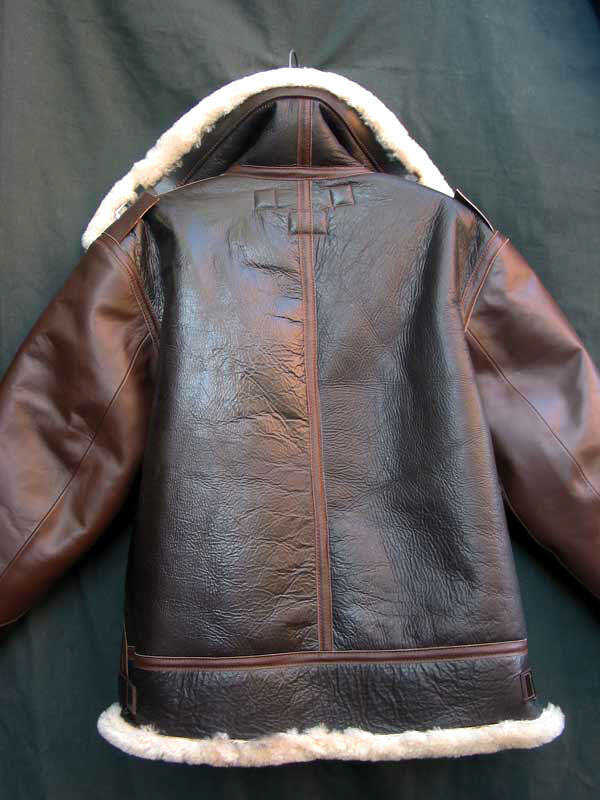 So different from any other jacket out there, because the B-3 isn't fashion, it's Style. Style and Fashion are wholly unrelated. The former articulates one's sense of self, tradition and value. The latter -- merely the Cappuccino flavor-of-the-month at Starbucks. Is $1750.00 expensive for such a jacket? No, a bargain. IF this is what you seek. These jackets, like all LOST WORLDS, aren't for everyone. Our customers wouldn't have it any other way. We're most amused by the "palm pilots" who squeak, "Why is it so HEAVY?" -- sorry, we're not psychoanalysts, we only make the best jackets of their kind in the world. Do real men ask, "Why does that Hemi have so many horsepower?" As we bemoan elsewhere on this site, Western man is a dying gender. The weight, the rapid break-in -- this is the fun part, molding the jacket to your shape and build, making it yours. And having a born and bred American classic that never fails to draw admiring (and often puzzled) glances. 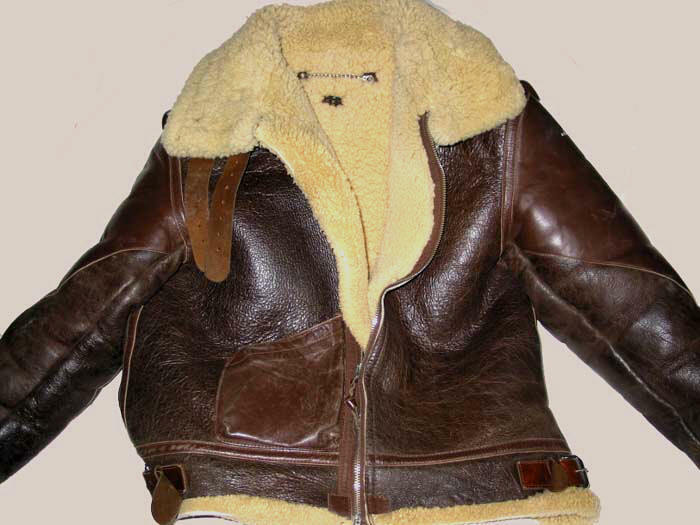 If you don't like frequently being asked about "that jacket you have on" don't buy our B-3! 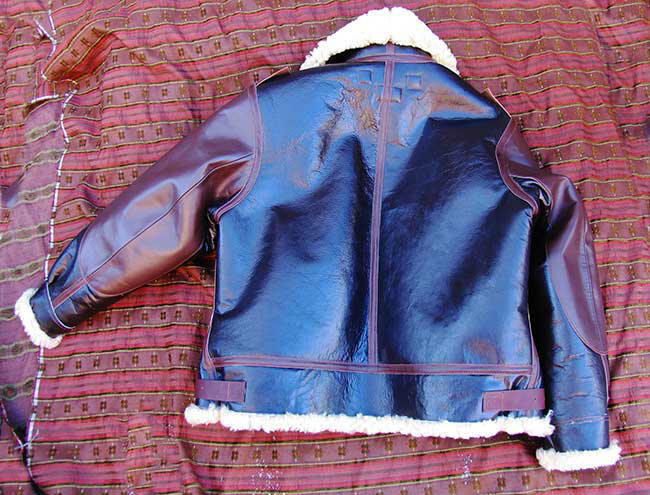 "The jacket is GREAT.....thanks......when I roll out of the kill zone I will send it back for any needed repairs... 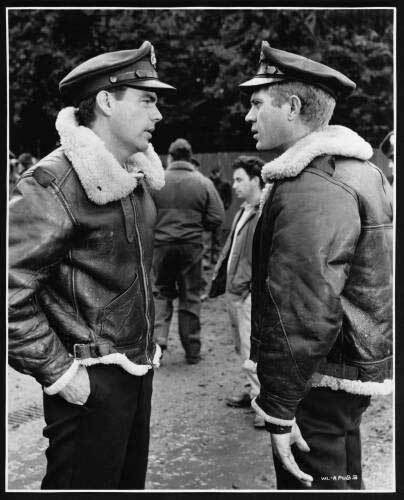 Thanks once again.."
"wonderful stuart, superb jacket...todah hahve!" Above shots of Lost Worlds B-3 after 18 years use. Changing tires, transporting cartons, walking the dog, in every kind of weather, rain and snow storms! Can you tell the difference between this and an original?